As far as I know, no one has ever made a stinging nettles congee. Well, at least according to Google. That’s right I found ZERO stinging nettles congee recipes online. So as far as the internet is concerned, your are witnessing the first ever nettles congee recipe. Still, it is a little odd to me. 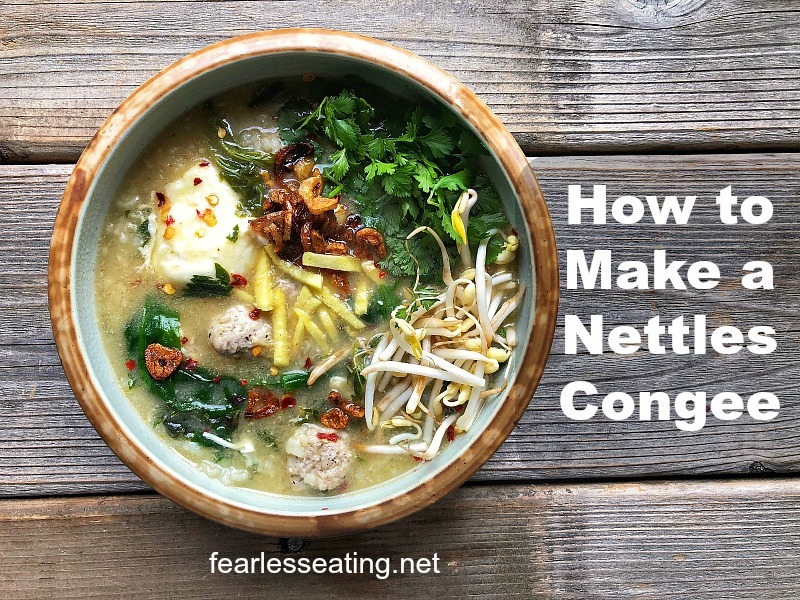 Surely, somewhere in the vast history of humankind, especially in Asia where congee is an every day food (and where nettles also grow), someone has made a nettles congee. 1. You’ve never made a congee. If you can simmer rice in water, you can make a congee. It’s what’s added to that basic foundation that makes it so versatile and delicious. Learn the basics for how to make congee here. Or just follow the recipe below! 2. You want to learn to forage for stinging nettles (and other spring edibles). Wild stinging nettles are one of the most widespread and easily found wild spring edibles. Two summers ago I wrote a post for how to find, harvest and cook nettles which includes a bunch of pictures for identifying stinging nettles as well as some foraging resource guides. 3. Nettles are a superfood. 1 cup of white rice simmered in broth will make about 8 servings of congee. Of course, you’ll need to add other ingredients but you can’t get food much more affordable than that! If you’d like more recipes beyond today’s post, I have an entire chapter in my book, Fearless Broths and Soups, devoted to congee. It’s also a good resource if…. 5. You have chronic digestive issues. Congee has been a staple medicinal food all around the globe for centuries, but especially in Asian countries where it’s thought to have originated. Besides the benefits of nettles you’ll also get the many benefits of bone broth. And at that top of that list is its anti-inflammatory effect on the gut. All you have to do is simmer white rice in broth for at least an hour. The rice will break down during the extended cooking time and form a porridge-like consistency. Add more broth (or water) during the simmering if needed. Then add your nettles and any other vegetables or meats along with it. Season it however you want – salt and pepper, soy sauce, chile sauce, etc. Personally, my favorite congee is this Thai congee which is from my book, The Thai Soup Secret. I simply adapted that recipe by adding wild nettles which, by the way, I found growing next to a small river right near my house! Simply make a congee (which is just rice simmered in broth), add in your stinging nettles at the end of the simmering and season it to taste with any of the common congee seasonings listed in the ingredients. Delicious and medicinal! Bring the rice to a boil in the broth and immediately reduce the heat to a very gentle simmer. Cover and continue simmering for 60-90 minutes, stirring frequently to prevent sticking, until rice breaks down and forms a porridge-like consistency. This can be thick or thin, depending on how you like it. Add a little less broth or simmer it a little longer with the cover off for a thicker consistency or vice versa. When the congee is ready, simply add the nettles and simmer another 5 minutes or so until they're fully wilted. They will lose their sting when exposed to heat and are safe to consume. Ladle congee into individual bowls and add any seasonings, in any combination you want, to taste.